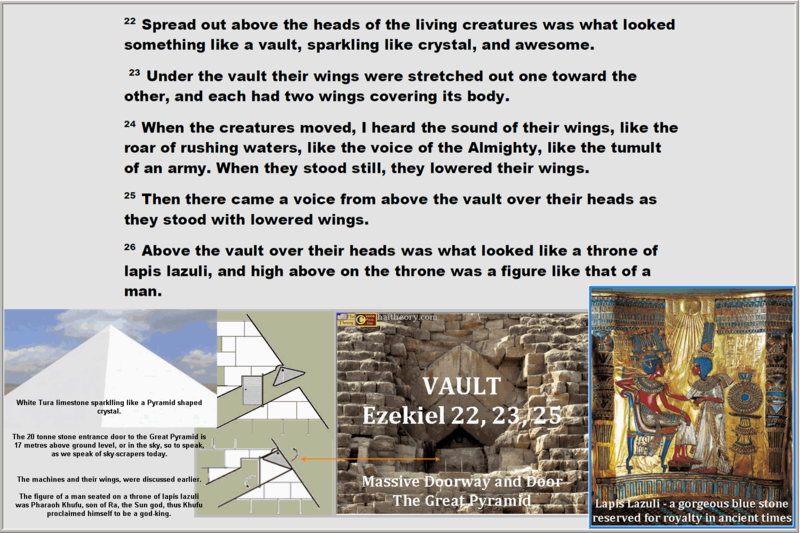 Ezekiel 1-29 decoded via the re-discovery of ancient Egypt's four-lobe pinion-pulley via composite artifacts, proves Khufu's Great Pyramid was constructed with mass production techniques requiring well developed critical flow analysis for perfect completion within the historically documented twenty year time-frame. 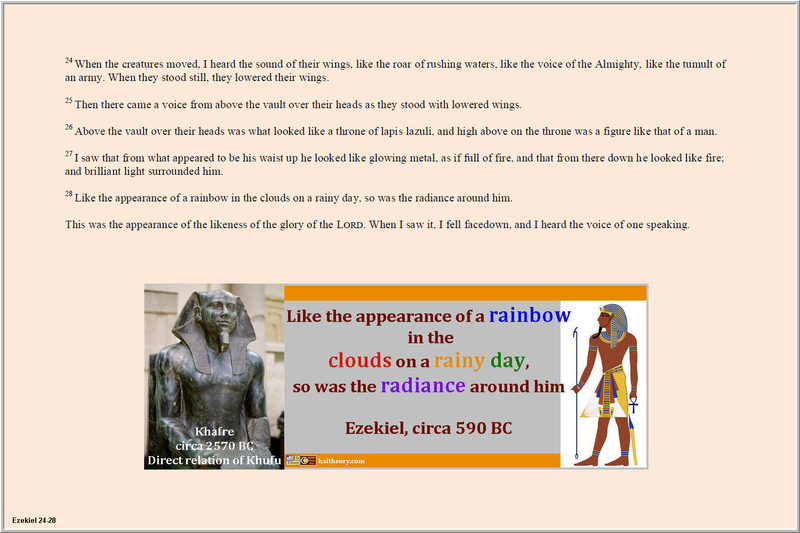 My name is Paul Hai and my website deals with ancient text documentation which tell us how the Pyramids of Giza were constructed. 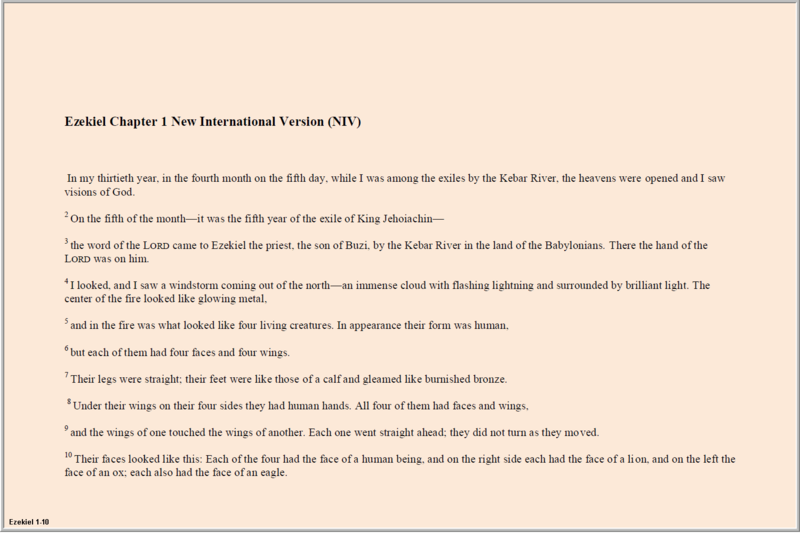 The first document is found in the Old Testament of the Holy Bible, written by Priest Ezekiel c.590 BC. The second document is written by Herodotus, a Greek historian widely regarded as being "the father of history". 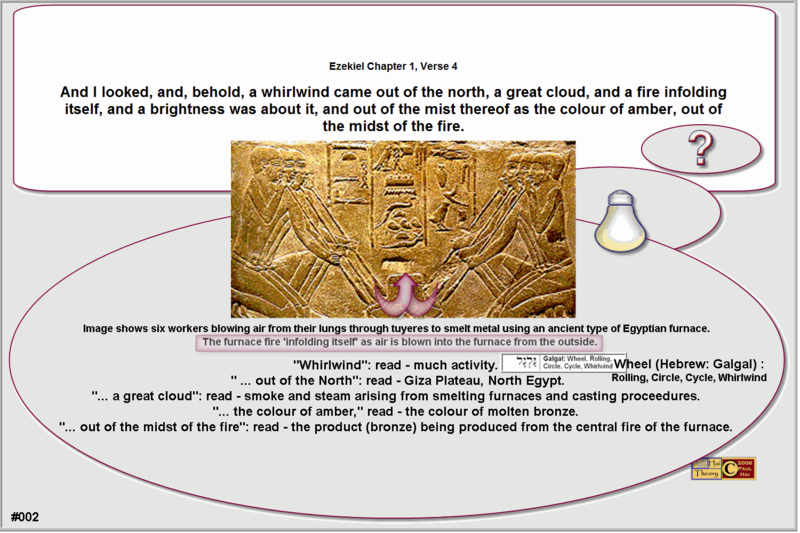 Herodotus asked many qusetions in his travels and recorded what he was told. 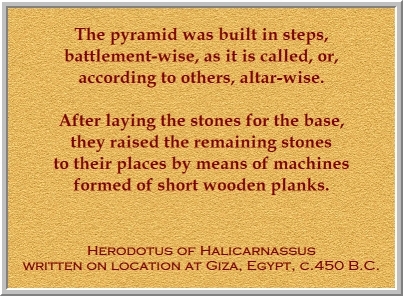 In c.450 BC the Giza priesthood personally told Herodotus what they knew of Giza Pyramid construction. 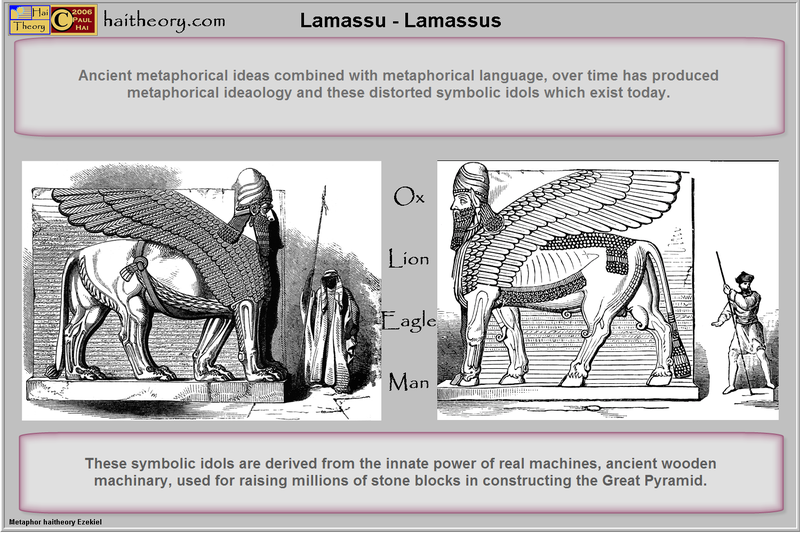 This website deals with ancient knowledge only and wholly refutes all modern Giza Pyramid construction theories as nonsense and/or not feasible. 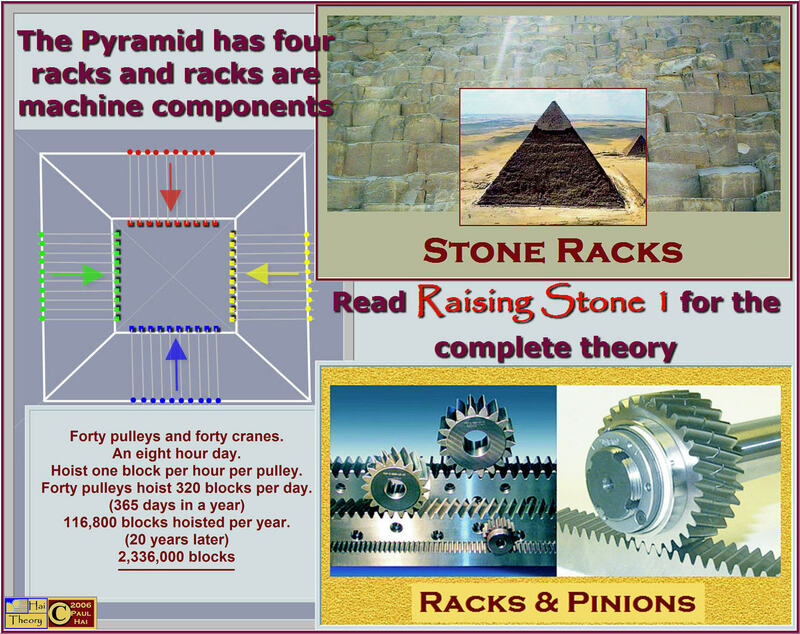 Those who have read "Raising Stone 1" have a head start in understanding the information given and others will need some patience in understanding the explanations and verifications of ancient Egyptian Pyramid engineering techniques. 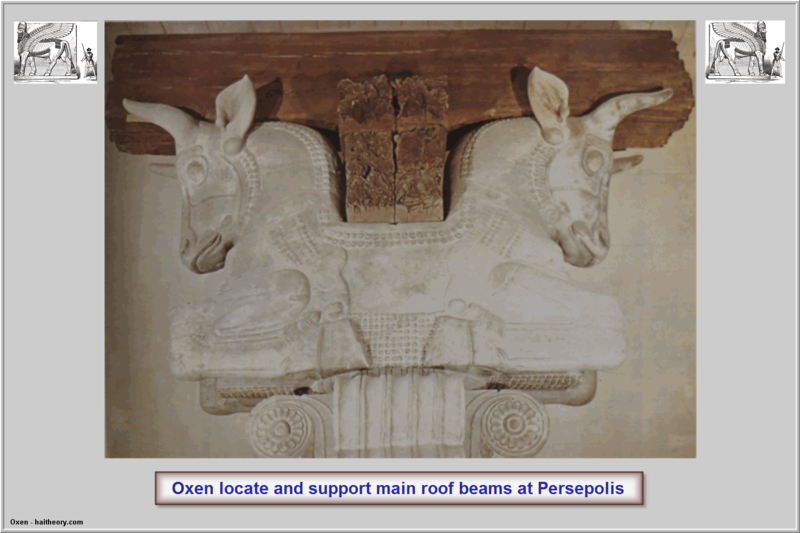 The ancient documents mentioned are critical for proof and primary source documentation, when and where it exists is demanded at university level research studies. 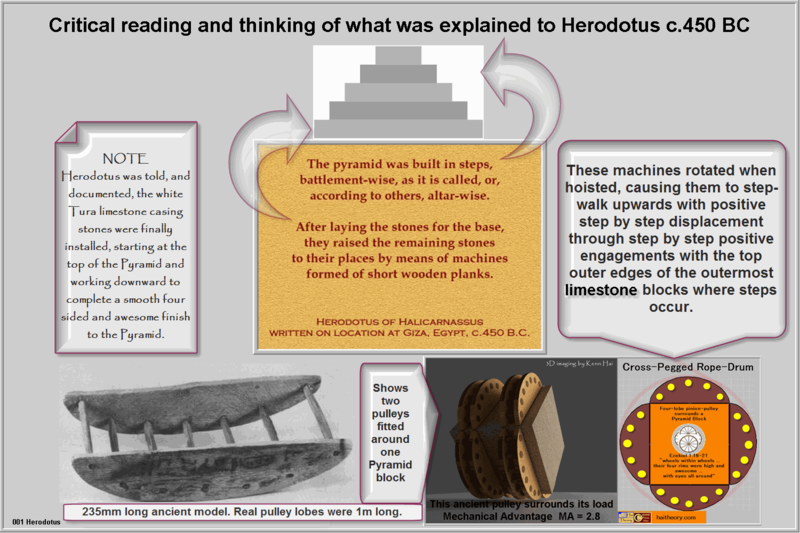 Unfortunately many university professors have concluded the Herodotus documentation is false regarding wooden machinary being used to construct the Great Pyramid and this has led to a steady flow of people intent on putting forward their very own ideas and what has resulted is a free for all of mostly complete and utter nonsense. 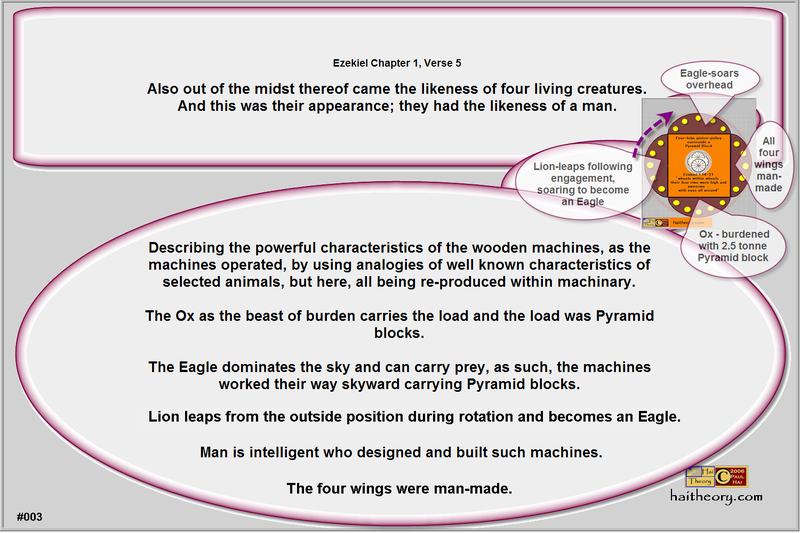 After I established the Herodotus documentation to be truthful, I then turned my attention to the machines mentioned in the Old Testament of the Holy Bible in Chapter 1 of the Book of Ezekiel to find the subject of the writing difficult to comphrehend, but have found common ground throughout the twenty eight verses. 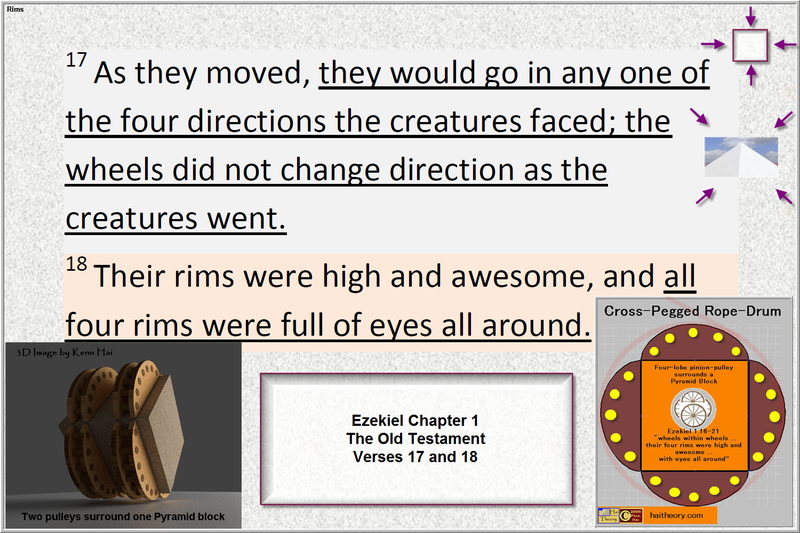 The descriptions in Ezekiel confirms the use of excavated wooden wheel lobes known to many as "Petrie rockers". 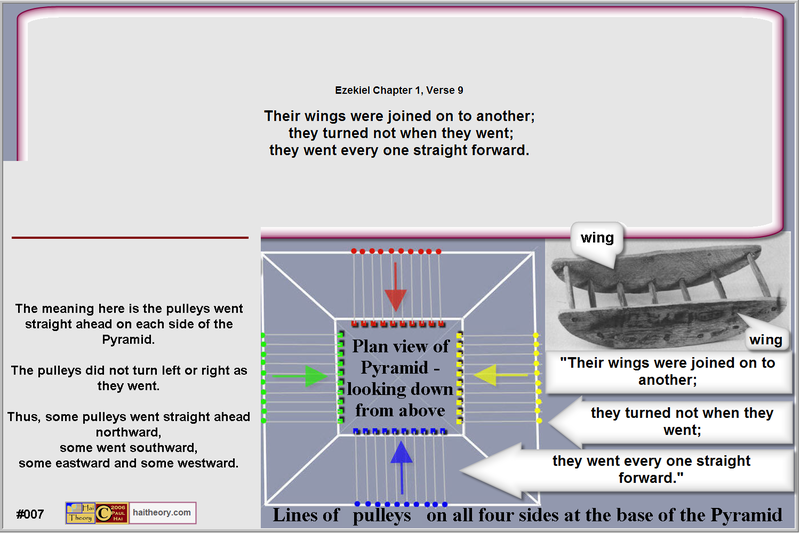 Anyone who is serious about understanding Giza Pyramid construction technique should limit themselves to three sources of study; Ezekiel Chapter 1, Herodotus - The Histories - Book 2 - Egypt and my book "Raising Stone 1" which is an engineering dialogue, or at least use this website as a study guide. 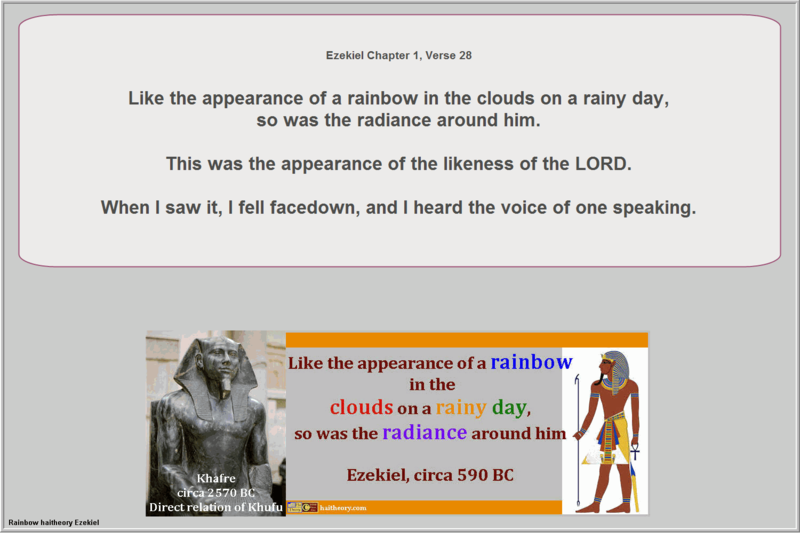 Ezekiel appears to write metaphorical nonsense and this may have been intentional as knowledge did and still is powerful. 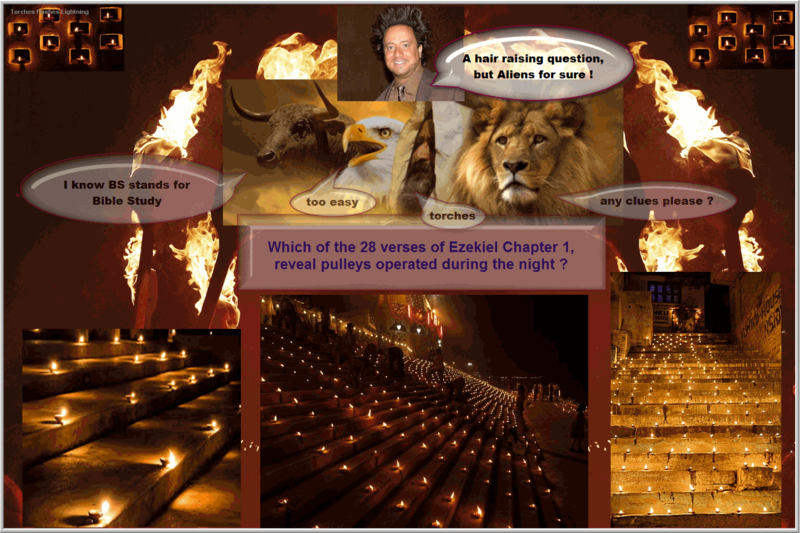 Reading studies begins with Ezekiel Chapter 1, verse by verse unless where some verses are repetative. If my reader decides to opt for modern theories promoting ramps and kites and such, of which there is an abundance, but all totally unstructured toward a critical result, there you will be lost. Lots of hot air out there and talk is cheap, so begin studying for what you wish to understand and listen carefully to what the ancient people have documented through their scribes. The answers are here, but patience, alertness, critical thinking and fortitude are required. 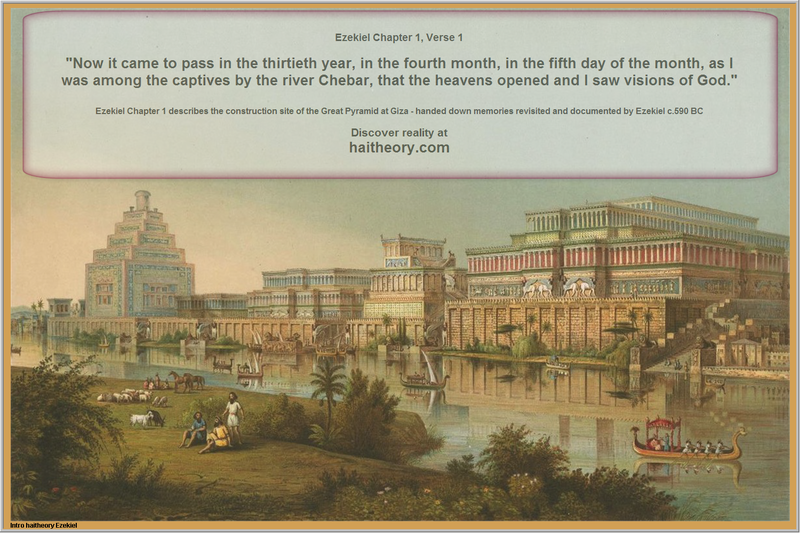 This story began on the banks of the river Chebar in Babylon c.590 BC with a group of people who met to tell what they knew of Giza Pyramid construction to their priest and scribe, who was known as Ezekiel. 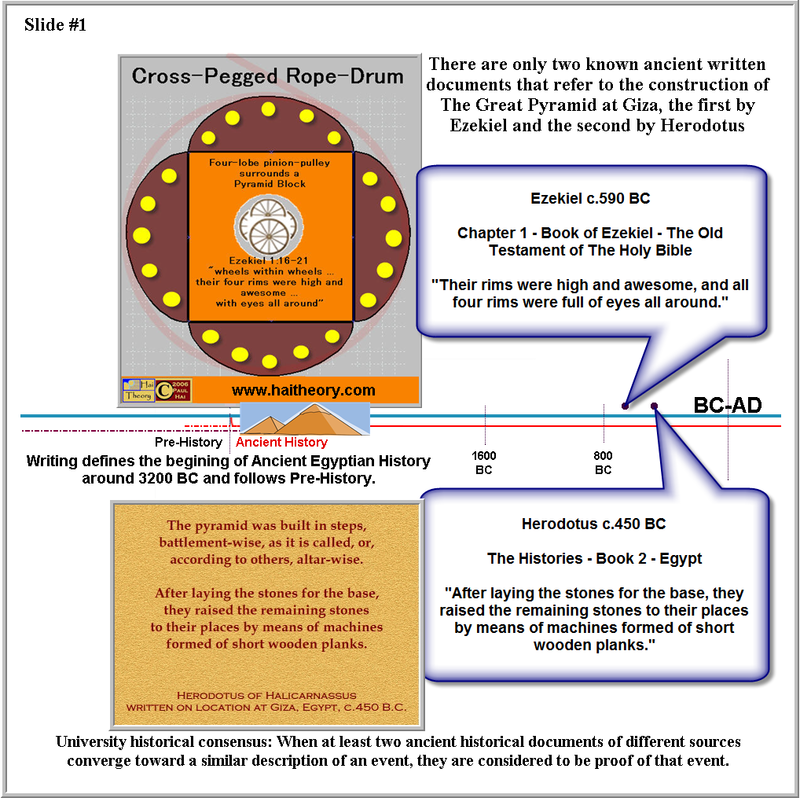 A TIMELINE runs midway horizontally and is focused on 590 BC and 450 BC. The Giza Pyramids are shown on the timeline around 2600 BC. 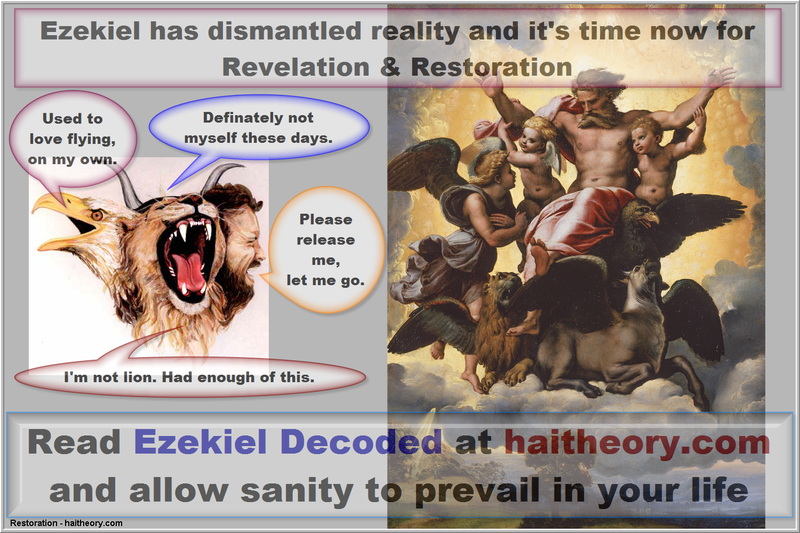 The top half deals with Ezekiel and the lower half deals with Herodotus. Be patient for the explanation of the machinary which involves real artifacts. The Egyptian god here was Ra, the Sun god. The Pharaohs of the Giza Pyramids described themselves as 'Sons of Ra'. Six workers use air from their lungs, blowing through tuyeres to provide a smelting temperature for bronze in the central furnace. The furnace fire infolds as they do this. Bronze was cast for tools and equipment such as chisels and feet for claw-lifts. Claw-lift feet were attached to long straight poles and were required to lift stone blocks for pulley fitting. Evidence for this includes the Ernst von Sieglin scientific expedition to Giza AD 1909-1910 and Ezekiel Chapter 1, Verse 7. 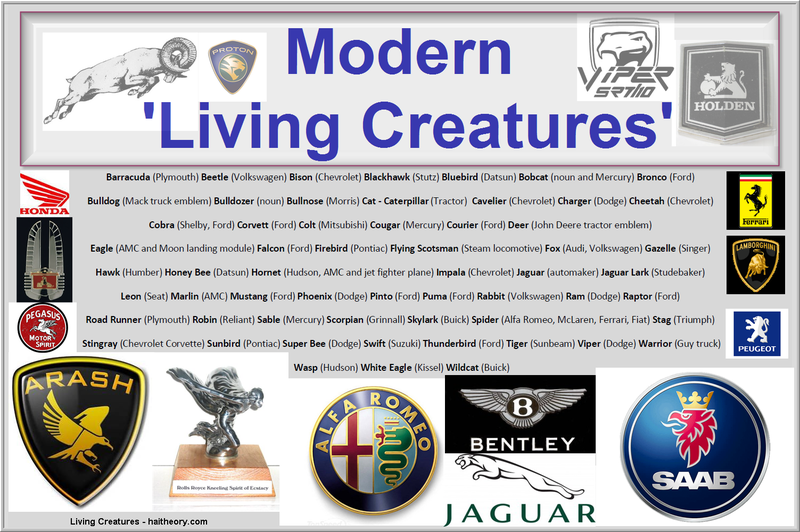 Living creatures means moving, in motion, rotating and climbing, dynamic. Machinary in motion. Machinary working. The creatures are the machines. 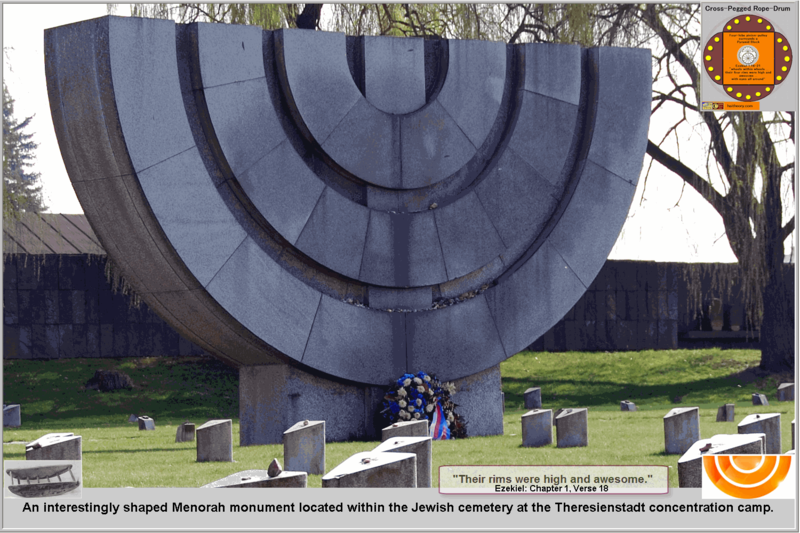 At least TWO historical documents which converge about an event are required by universities as reasonable proof about that event. TWO historical documents concerning Great Pyramid construction are listed below. 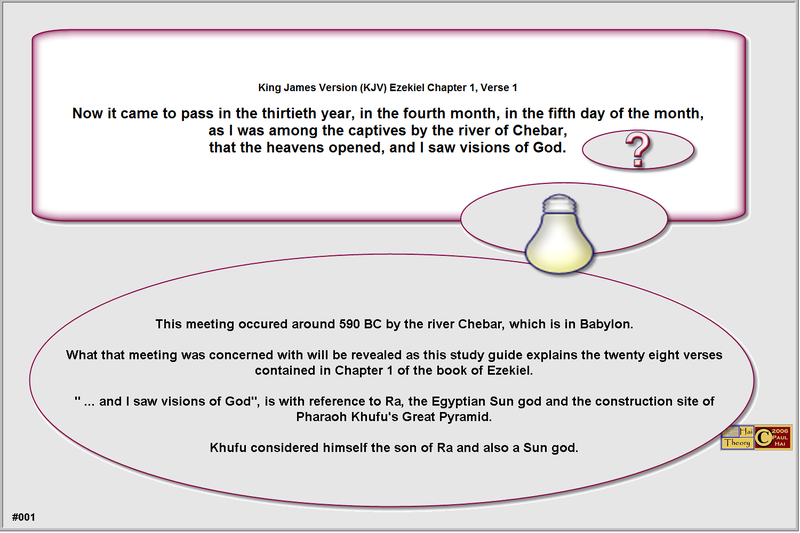 Ezekiel 1-28 decoded via the re-discovery of ancient Egypt's four-lobe pinion-pulley (27 August 2006) via composite artifacts, proves Khufu's Great Pyramid was constructed with mass production techniques requiring well developed critical flow analysis for perfect completion within the documented twenty year time-frame. 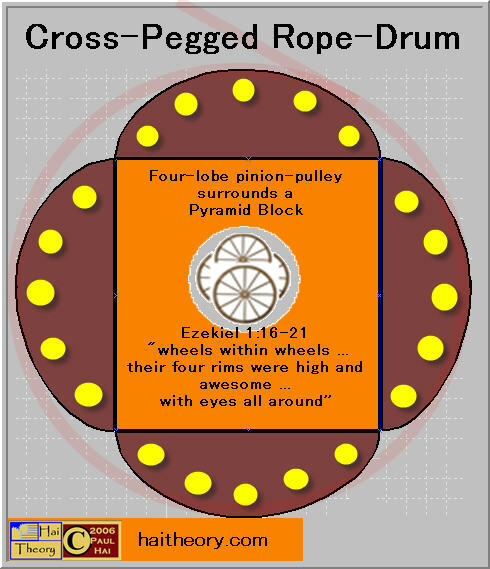 The four-lobe pinion-pulleys are Ezekiel's "wheels within wheels" machines. RAMPLESS Pyramid construction began with Pharaoh Sneferu's RED Pyramid at Dahshur, and later at Giza for the Pyramids of Pharaohs Khufu, Khafre and Menkaure. Please keep reading carefully - do not preemt anything until you have studied the ancient historical documents and ancient artifacts this re-discovery is very firmly founded upon. These four Pyramids were constructed using a unique type of wooden pulley, hitherto unknown in the modern world. 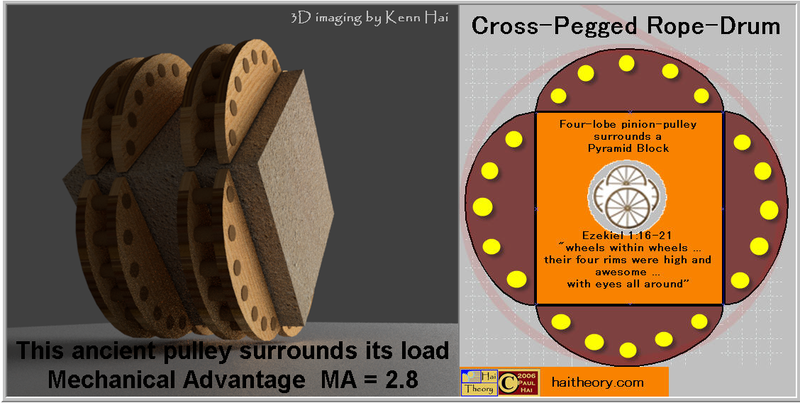 The Pharaonic pinion-pulley operates on Class 2 lever principle (Effort-Load-Pivot) with a Mechanical Advantage of 2.8 (MA=2.8), therefore technically qualifies as a MACHINE. This jargon means that a 2500 kg Pyramid block can be hoisted with a lifting effort equivalent to 900 kg. The pulley makes Pyramid construction effective and very efficient and without any need for ramps simply because the four stepped sides of the Pyramid are used progressively throughout construction. Herodotus reported absolutely correctly, however many people prefer anything but the truth. You see there is no mention of RAMP or RAMPS, so please ask yourself, why do the invented modern comedies of errors exist and are offered as ancient Egyptian history ! ? 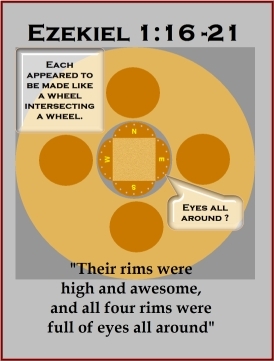 Ezekiel writes of machines thus,"their rims were high and awesome, and all four rims were full of eyes all around." A Pyramid block with pulleys fitted is about one metre wide and one and a half metres high. When numerous pulleys were ascending the Pyramid during the cool of night by firelight, the scene would certainly be high and awesome. 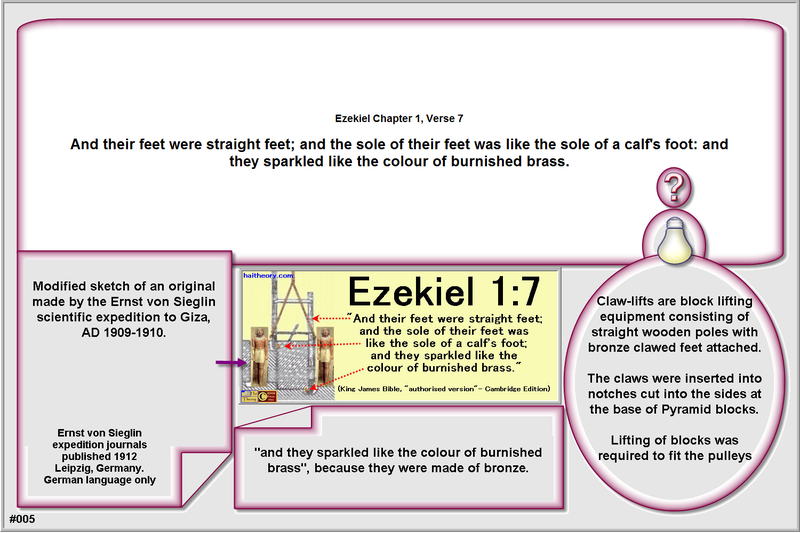 Ezekiel writes of what appears to be the lifting devices used to fit the pulley lobes (faces with eyes all around/wings) which he writes are straight with a calf shaped foot made of bronze. 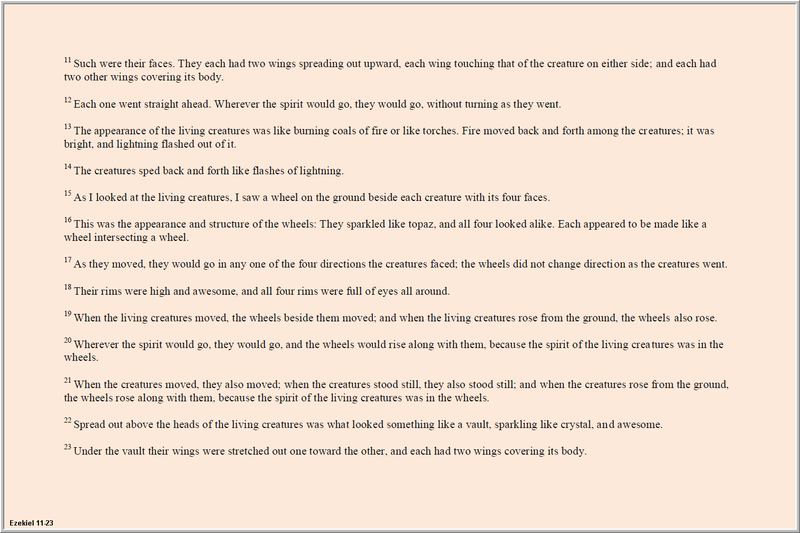 "And this was their appearance: they had the form of men, but each had four faces, and each of them had four wings. Their legs were straight, and the soles of their feet were like the sole of a calf's foot; and they sparkled like burnished bronze." 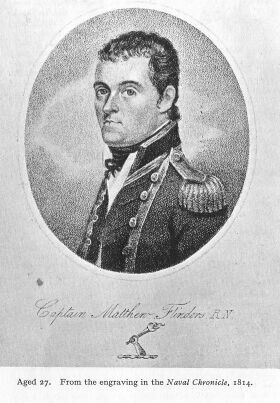 Captain Matthew Flinders (1774 - 1814), famous navigator and cartographer of Australia's coast. Flinders suggested the name 'Australia' which was adopted in 1824. 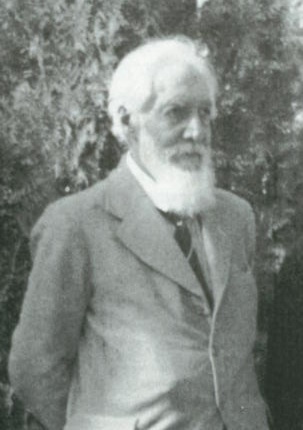 His grandson became a leading excavator and curator of Egyptian artifacts known to everyone as "Petrie". He became Professor Sir William Matthew Flinders Petrie (1853 - 1942). 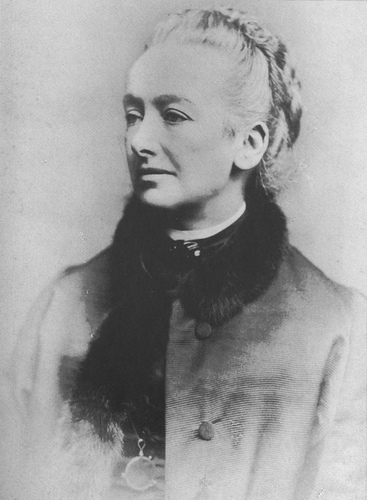 Amelia Ann Blandford Edwards toured Egypt during 1873-74 with friends and saw Egyptian artifacts needed to be preserved. In London, Amelia and Reginald Stuart Poole founded the Egypt Exploration Fund, which is now known as the Egypt Exploration Society. Petrie was paid 250 British Pounds per month from the Fund to excavate in Egypt. 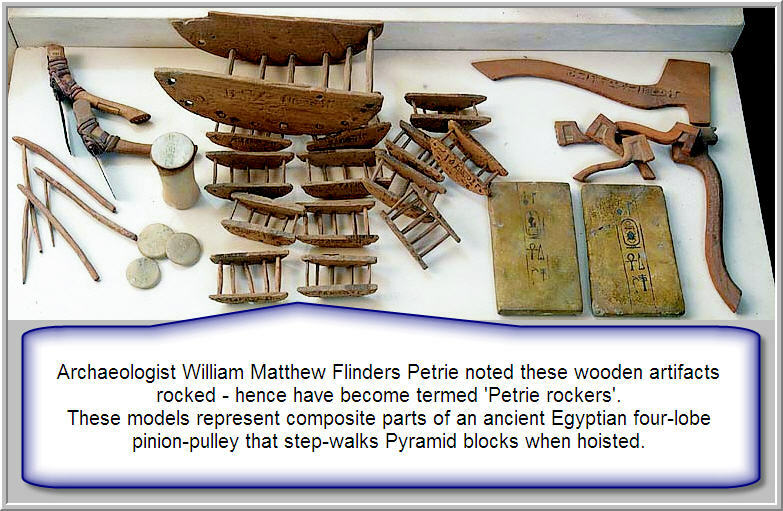 In 1895 Petrie was excavating at Deir El-Bahari and excavated wooden items that have become known as "Petrie rockers". 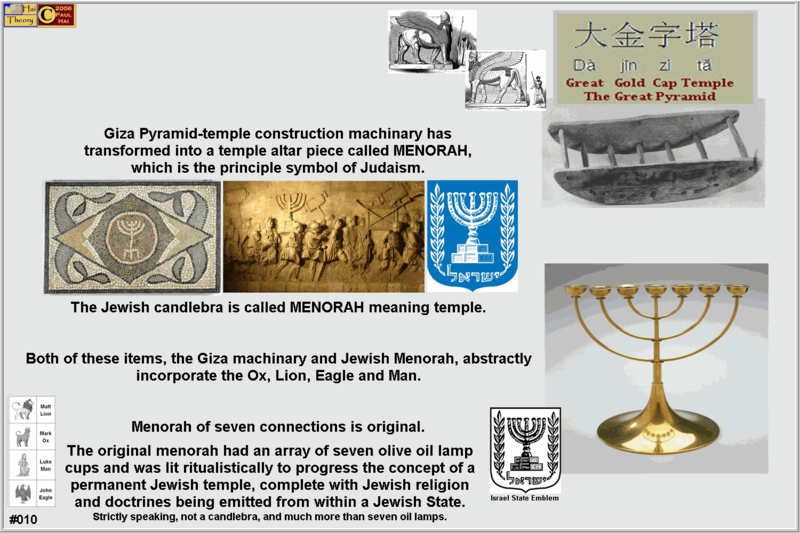 Petrie suspected these items were used for the construction of the Pyramids and his assumption has been proven correct. Petrie had excavated wooden pinion-pulley lobe quadrants which are components of an ancient pulley hitherto unknown in the modern world. This pulley surrounds its load, which is a Pyramid block, and then as it is hoisted the pulley step-walks the Pyramid's stepped layers with a mechanical advantage of 2.8 (MA=2.8). Petrie died in Jerusalem unknowing that "Petrie rockers" are components of an ancient pulley and one of the most important excavations he made. 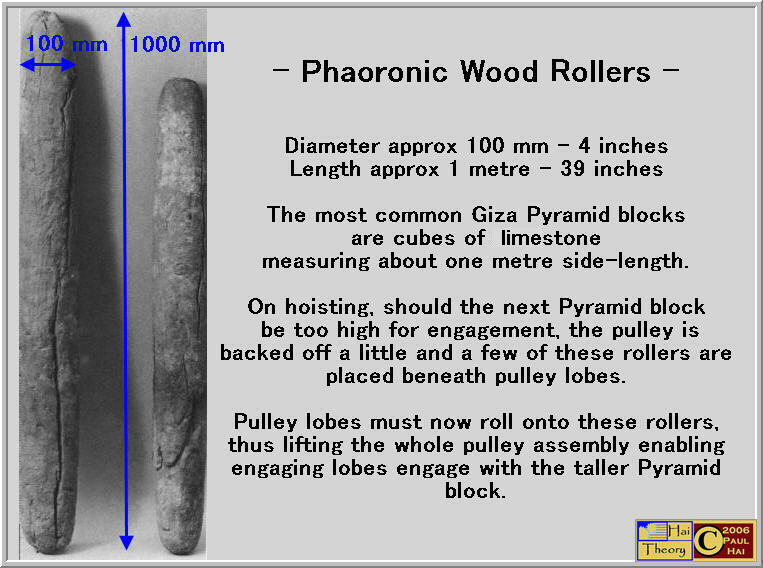 The book "Raising Stone 1" is in the Egypt Exploration Society Library in London and explains the operation of the ancient Egyptian four-lobe pinion-pulley with relevant and specific background material. A Pyramid progressively under construction already has four sides of steps upon which step-climbing pulleys can step-walk stones upward, similar to how three wheels of a step-trolley move over steps. 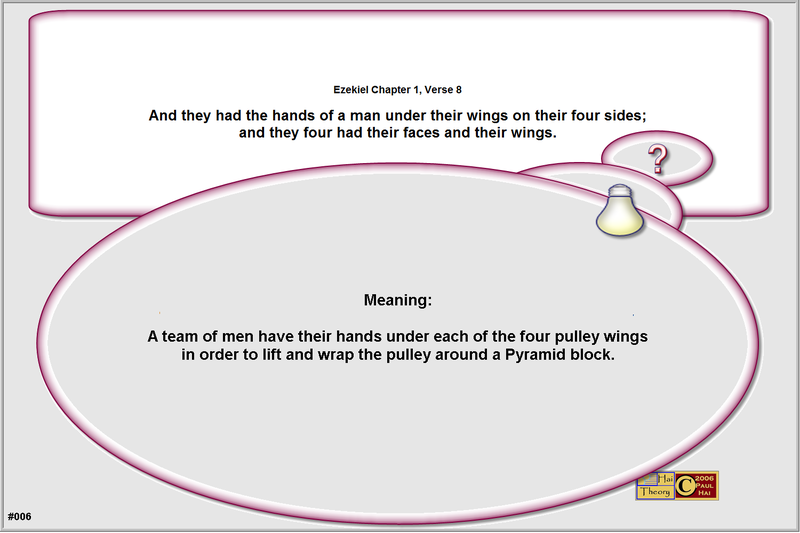 Ancient Egyptian engineers were intelligent and innovative having built four Pyramids at least without using ramps, those of Pharaohs Sneferu (Red Pyramid), Khufu, Khafre & Menkaure. Students of Ancient History are now discovering this no-nonsense ancient method of Pyramid construction by studying "Raising Stone 1"
The Encyclopaedia of Ancient Egyptian Architecture by Dieter Arnold et. al.